WPFC '93 Black celebrates a goal in the Championship. 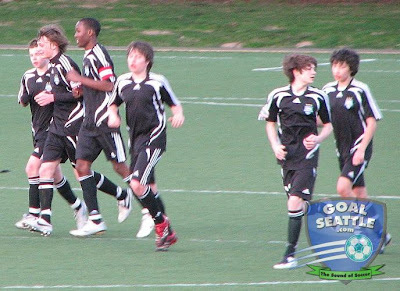 Former Tacoma Stars defender Ralph Black coached his son Tyler to a State Championship on March 8th. From our roving sideline reporter: Many coaches may have won 2 WSYSA state championships in one year, but how many have won those championships with their sons on the teams they coach? Well, there’s now at least one in this exclusive club, Ralph Black! Having already won the BU11 Challenge Cup with his son Tyler, on Saturday, March 8th, Coach Black completed this double when the WPFC Boys’ ’93 Black team, including his son, Andrew, defeated HSC Heat 2-0. The fans had hardly settled into their seats when WPFC opened their account. Heat had the kickoff, turned the ball over almost immediately and Dom Dismuke led a quit counter that produced a corner. Bryce Joling and Austin Sweeney worked a short corner - and talk about fast, after having worked the short corner, Austin got into the box to finish the play! 1-0 WPFC a minute into the game, spurring the raucous group of WPFC supporters in the stands to make even more noise! The rest of the first half was dominated by WPFC possession, producing numerous scoring opportunities, punctuated by quit counters by Heat. The WPFC defense of Brett Bertrand, Jordan Cohen and Ely Peterson backed by goalies Ian Clark and Troy Albin held firm, however, and in first half injury time, Ceasar Ramos got the ball in the box, turned on a dime and slotted home a shot to the far post to put WPFC up 2-0. In the second half, WPFC’s midfield of Bryce Joling, Andrew Black, Ian Lange, Ike Crook and Austin Sweeney continued to dominate the mid and possession. And when substitutes Bryce James, Steffen Bangsund, Jimmy Hong and Griffin Stout entered the game, they if anything increased the pressure on Heat. The game became increasingly physical as the Heat’s frustration against WPFC’s possession and great wall of defense was displayed by numerous fouls, some producing yellow cards. WPFC, however, kept its poise and shepherded home a dominating 2-0 victory against a game Heat squad that never gave up and fought through to the final whistle. The WPFC BU93 have now played in 4 consecutive state finals, everyone against a different opponent, and have emerged victorious on 3 of those 4 occasions, and have compiled a record of 55 wins and 6 ties in the last two years against in state opponents while suffering only 3 losses. This group of boys truly deserves to represent the state and WPFC in the Region 4 tournament in Hawaii this June. Aloha boys! Talking about soccer / fubtol in the South Sound!